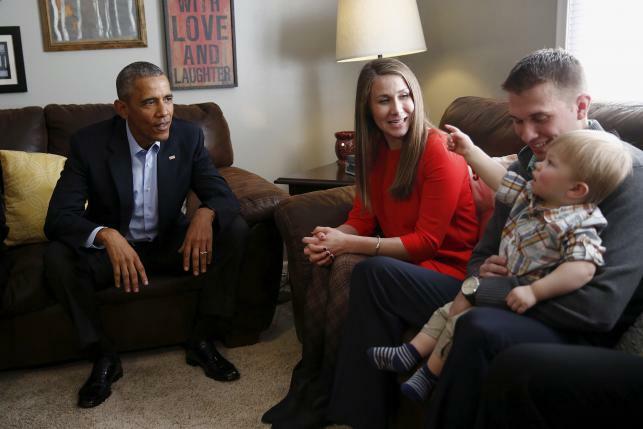 President Barack Obama visited a young family in their suburban Nebraska living room on Wednesday, the first stop on what the White House said will be a year-long tour to talk before he leaves office about fixing the country’s polarized politics. His trip to Nebraska, a Republican “red state,” is meant to help promote the big-picture ideas he laid out in his final State of the Union speech on Tuesday, where he said he regretted American politics had become more rancorous. Obama spent about 40 minutes visiting with Lisa Martin, who sent him a letter last year she wrote at 4 a.m. when she was awake feeding her son Cooper. In the letter she described her “overwhelming sense of dread” about climate change. “Will he be able to experience the small things, such as winter in Nebraska, where he has snow days and sledding?” Martin wrote in the letter, expressing feelings of powerlessness. “Call it sleep deprivation or desperation, but something made me want to email the president that night, so I did,” Martin said on Wednesday. Afterwards, Obama reprised his address to a packed-to-the-rafters crowd of 11,000 at a hockey rink at the University of Nebraska, a state where he acknowledged he got “whupped” in his 2012 re-election campaign. Obama said that American economic and foreign policy is stronger than described by “a bunch of folks right across the river” – a jab at Republican presidential candidates campaigning for the party’s nomination in the early voting state of Iowa. “That’s just hot air. That’s bluster. That’s not serious,” Obama said. “There’s another word for it that starts with a ‘b’ – it’s baloney,” he said. Obama has said he hopes to work with the Republican-led Congress on a few issues where there is common ground in his final year: criminal justice reform, passing a sweeping Asian trade deal, and addressing heroin addiction and poverty. But on a host of issues Congress does not support him, such as curbing climate change, and the race to win the Nov. 8 election to succeed him overshadows Obama’s push to cement his legacy. Obama was due to fly on Wednesday to Baton Rouge, Louisiana – another red state – where he will take questions from residents at a town-hall meeting on Thursday.